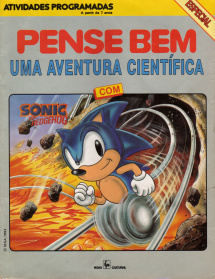 Pense Bem: Uma Aventura Científica com Sonic the Hedgehog (translated from Portuguese as "Think Well: A Scientific Adventure with Sonic the Hedgehog") is a 1993 educational book published by Nova Cultural Ltda. The main purpose of the book is to work in conjunction with the Tec Toy-developed Pense Bem system. The book, aimed at children between ages 6 and 12, has various educational puzzles and games in areas such as reading, vocabulary, logic and basic scientific ideas. The book is one of three Sonic-related Pense Bem titles developed. This page was last edited on 2 September 2015, at 20:56.